A cataract is a clouding of the eye’s naturally clear lens. Your eye becomes like a window that is frosted or yellowed. As a result, light inside the eye is scattered before it can focus on the retina, and vision becomes blurry or dark. Some people begin experiencing the early effects of cataracts (such as a gradual loss of near vision) in their mid-40s. By age 65, a large percentage of us will develop a cataract, most often typified by cloudy/fuzzy vision and problems seeing in low-light environments. Developing a cataract doesn’t mean a permanent loss of vision quality, or having to give up the things you love, because cataract surgery is a safe, effective way to improve your vision. Cataract surgery is the most commonly performed surgery in the United States, with well Performed almost exclusively on an outpatient basis, cataract surgery is microsurgery, whereby the natural lens is removed and replaced with what is called an intraocular lens (IOL). The procedure is extremely successful and Dr. Crews is a highly skilled cataract surgeon who has helped thousands of patients with cataracts to regain their best vision in the Pacific Northwest including Vancouver, WA and Portland & Central Oregon. An intraocular lens (IOL) is the replacement lens that is surgically implanted in the eye to replace the existing clouded lens during cataract surgery. Cataract and lens implant surgery today is highly successful and very precise. A monofocal IOL is a fixed lens (it doesn’t move) that is designed to deliver improved vision at just one distance (usually far). The potential drawback is that after surgery, you will probally need to wear glasses for near vision, even if you didn’t wear glasses before surgery. 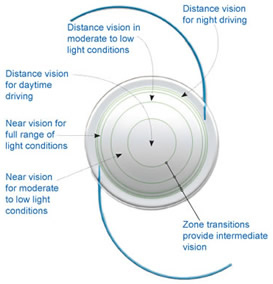 A multifocal lens uses multiple visual zones that are built into the lens itself to provide vision at various distances. It’s almost like the rings of a target, with some rings being dedicated to distance vision, while others are used for near vision, similar to having a bifocal or trifocal lens inside the eye. There are presently three brands of Multifocal IOLs to choose from: ReZoom™, ReSTOR®, and Tecnis®. As the name implies, an accommodating lens “flexes” or “accommodates” to focus on subjects at various distances, delivering a continuous range of vision at near, intermediate and far. Crystalens® is the first and only FDA-approved accommodating intraocular lens.